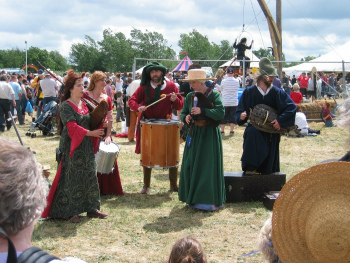 The Tewkesbury Medieval Festival 2016 takes place on 9th & 10th July, 11am to 6pm (5pm on Sunday), on fields just south of Tewkesbury, Gloucesteshire, post code GL20 5TT for satnavs. 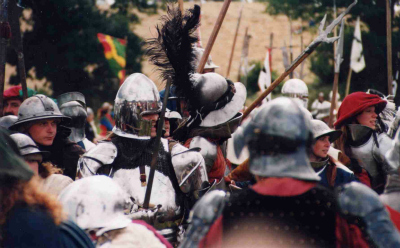 The festival features a huge medieval fayre, camp, and market, with entertainment and a battle re-enactment with around 2000 re-enactors (at 4pm on Saturday and 3pm on Sunday) which commemorates the 1471 Battle of Tewkesbury, and takes place on part of the site of the original battle. Spokesperson for the event Peggy Clatworthy has kindly agreed to answer a few questions for History-for-Kids. Hfk: What sort of people go to a medieval festival? PC: The festival attracts a wide range of people. A lot of families come for a (free) day out; it also attracts teenagers looking for something different to do, and older people, who love browsing the huge market. We know from correspondence that we have had visitors from as far away as America and Australia who have planned their holiday around a visit to the festival. Local hotels, guest houses, camping and caravan sites are fully booked months in advance. Hfk: What is there at the festival for children? PC: There are jesters, minstrals, horsemen, stilt walkers and a whole host of other entertainers around the site. Children might come across dragons, or be able to see a knight getting helped into or out of his armour by his squire. The Tewkesbury Medieval Festival now also has the Bright Knight Learning Tent, where they can talk to some of the people who take part in the battle re-enactment, and possibly try on a helmet or feel the weight of a shield. Young children love the festival. They can see things they are taught at school coming to life before their eyes. They are usually delighted to find children of their own age dressed in medieval costume and living a medieval life style. Hfk: How historically accurate is the battle re-enactment? PC: Whilst our battle re-enactment is probably the largest medieval event of its kind and has been described by people who have taken part as the nearest experience they can have to being in a real medieval battle, it is of course smaller (and safer) than what happened on May 4 1471. Then, around 12,000 fighters took part - our event has somewhere around 2,000. Then, thousands were slaughtered, so far we have not lost anyone! Apart from that our battle is as accurate a reconstruction of the original as we can make it, with incidents that are known to have happened in 1471 recreated on the field. It does take place on part of the site of the original battle. On Saturday evening when the fair site closes at 6pm the festival moves into the area around our magnificent Abbey where a small band of re-enactors recreate the infamous storming of the Abbey and dragging out of defeated Lancastrians. This is followed by their summary trial and (not too serious) execution at the hand of the dreaded axeman. Hfk: Do any of the re-enactors ever get carried away and injure each other? PC: Safety is a major issue, and the event is very closely controlled - everyone taking part is a member of an experienced group and anyone new to re-enactment is kept out of the main area of fighting for their first year. There are strict rules of engagement, for example blows to the head are completly banned and arrows are never shot directly at anyone. Anyone believed to be acting dangerously or getting carried away would be sent from the field by one of our eagle eyed marshals. Many re-enactors are traders, who travel from across the globe to take part, live in complete medieval style for the whole weekend. All festival visitors are welcome to visit them in their living history camps around the site including the sumptuous camp of King Edward IV and his court. They are extremely enthusiastic and well informed about what they do, and love talking about it to others. Hfk: Are any of the organisers serious historians, or do you view it as just a bit of fun? PC: We are very serious about local history, particularly the day that our small town stood at the crossroads of English history. However, whilst the event is great fun, it is not a strict copy of a medieval fair; more an attempt to re-create the atmosphere of one. Hfk:Thanks Peggy. Do you have anything else to add to convince people to come along? PC: With over 100 stalls and a whole host of entertainers, there really is something for everyone; The Bright Knight tent provides medieval based arts and crafts and hands on displays for children, the large and colourful medieval market offers some unique shopping opportunities and a chance to watch medieval style craftsmen and women at work. The huge beer tent offers a range of real ales, including some specially brewed local brewers for the event, and our caterers can provide everything from a full roast dinner to an ice cream, with plenty of vegetarian options. In the town of Tewkesbury. Should be one of their own. Deposed him and seized power. Was where the two sides met. They'd been marching for longer. Hiding in a nearby wood. Now called "The Bloody Meadow". How do you think it got that name? It was the House of York that won. 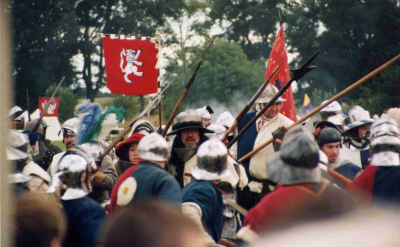 The 1471 battle of Tewkesbury was a key battle in the Wars of the Roses. The Wars of the Roses was a power struggle that went on for several generations, between two families, the houses of York and Lancaster, both descended from Edward III. In 1471 the king was Edward IV, of the House of York. He had recently deposed the mentally unstable Lancastrian Henry VI and sent him to the Tower of London. Henry’s wife (Margaret of Anjou) and son (Prince Edward) had raised an army to try to restore Henry to the throne. Their plan was to join up with Jasper Tudor’s army in Wales, and they were trying to cross the river Severn at Tewkesbury when the king’s army caught up with them. Even though they were outnumbered, the Yorkists (who included on the battlefield the king and also his brother the future Richard III) were tactically superior to the exhausted Lancastrians. The Lancastrian soldiers were slaughtered trying to escape, in a field still known today as Bloody Meadow; the leaders were executed, including the commander the Duke of Somerset, and Prince Edward, who is buried in Tewkesbury Abbey. Margaret fled the scene but was later captured at Little Malvern, and thrown into the Tower of London. The Yorkists may have won this battle, but 14 years later the new Lancastrian leader, Henry Tudor, would defeat Richard III at the Battle of Bosworth. Henry became Henry VII and married a Yorkist princess, ending the family feud for good. Click here to visit the official festival site.